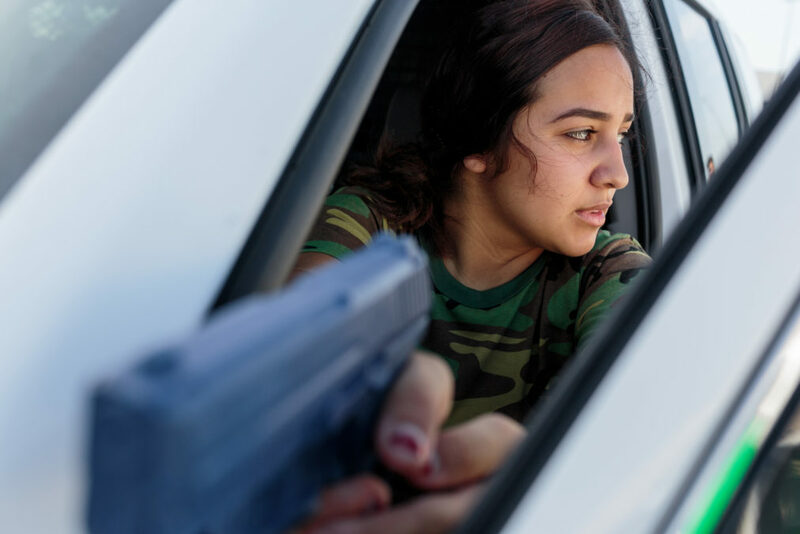 A student from the Border Patrol Explorer Program in Kingsville, Texas, practices a high-risk car stop. 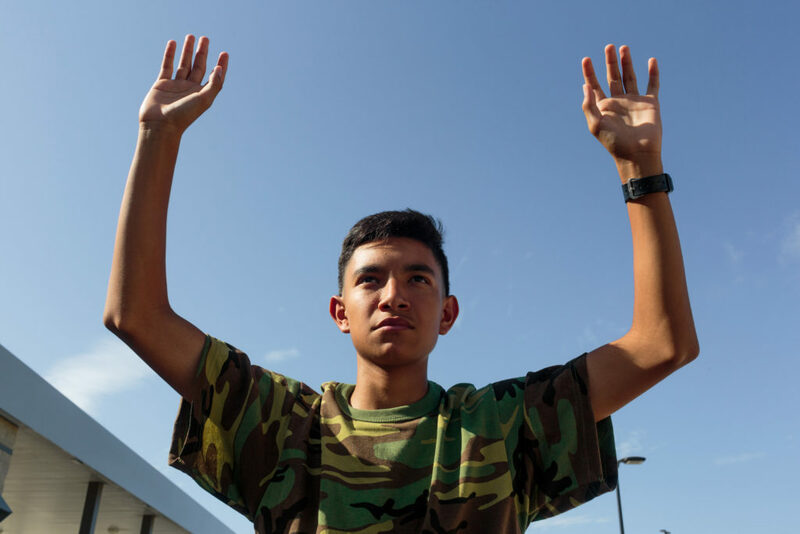 Eighteen-year-old Victoria Chacón spent much of this past winter and spring learning to shoot an M4 rifle and disarm a knife-wielding attacker. She also studied immigration history and law, camped in the mountains, and put on boxing gloves and sparred. 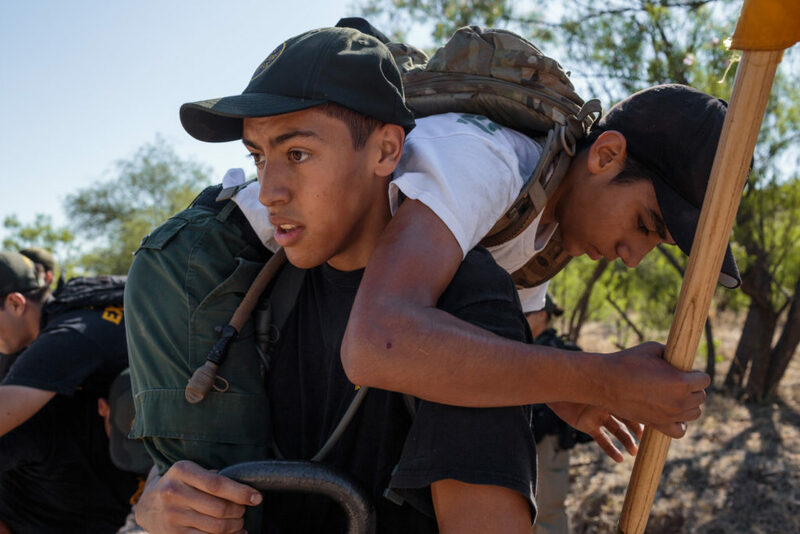 Chacón was one of 18 kids from Nogales, Arizona, between the ages of 14 and 20 enrolled in the Border Patrol’s Explorer Program. 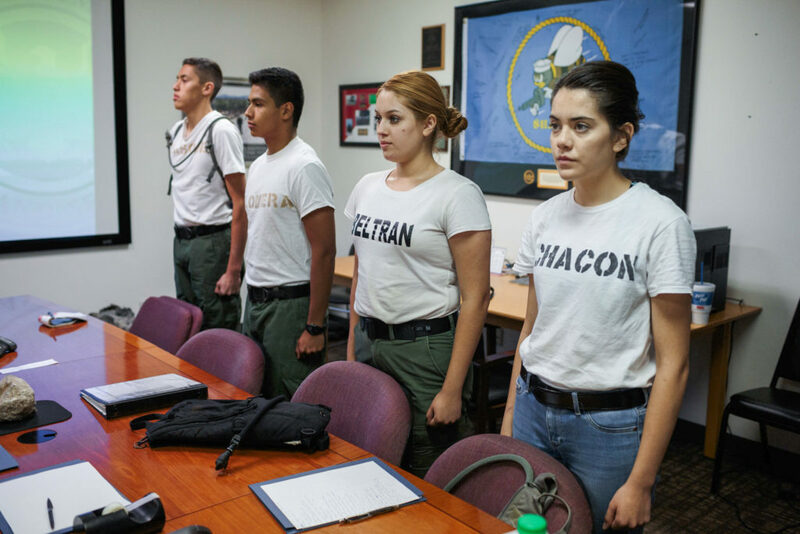 The daughter of a Border Patrol agent, Chacón had known for years that she wanted to join the program. “My dad would tell work stories,” she says. 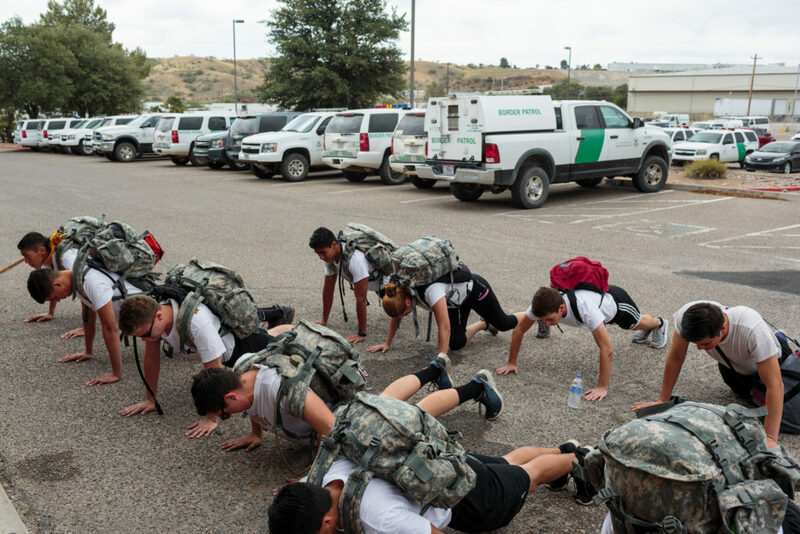 Border Patrol work is a complicated affair for Mexican American families, bringing with it questions of allegiance and identity, as photographer Sarah Blesener discovered while spending time with Explorers in Nogales and in Kingsville, Texas, this past June. 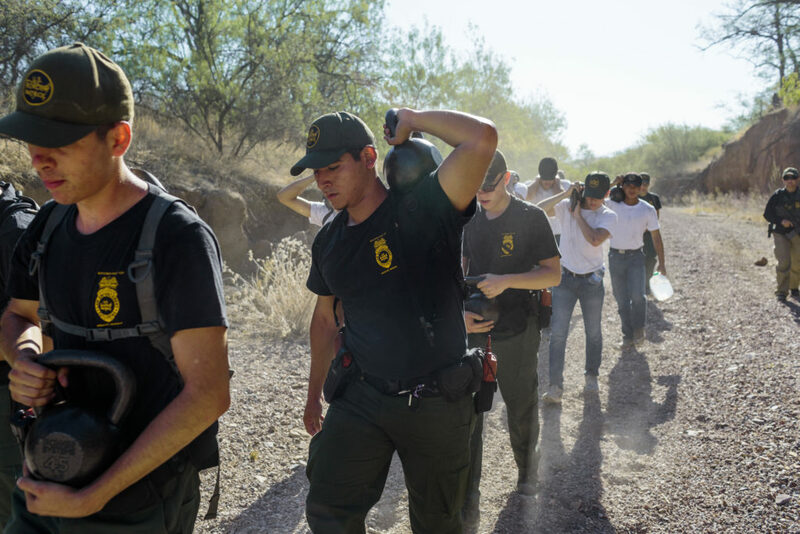 One image that stuck with her was of students walking along the U.S.-Mexico border for hours with a heavy kettlebell in one hand in the searing heat. “Almost all of them had immigrated with families, or their parents had come themselves,” Blesener says. Chacón, like most of her peers, has family in both Mexico and the U.S. Her father was born in Los Angeles; her mother, in Chihuahua. Spending time with her Mexican relatives and with friends in Nogales who have family across the border, Chacón became accustomed to jokes about “la migra.” Like others in the Explorer Program, she recognizes that Border Patrol work, though dangerous, represents one of the more stable livelihoods in the region. Almost everyone in a border town makes money off the border, and pay for agents starts at more than $52,000 per year. Chacón says she empathizes with undocumented families crossing the border. Still, she says, “you can’t just let anyone come in. I do think there has to be some kind of immigration reform. 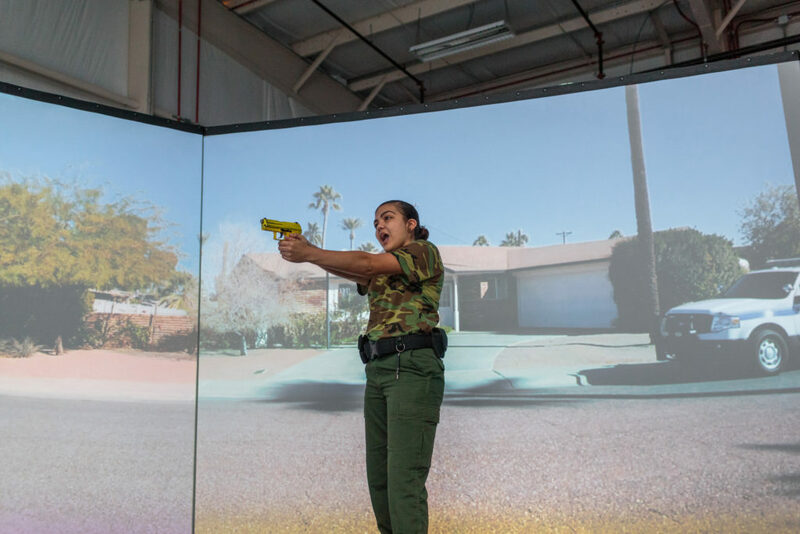 Something needs to change.” Now a freshman studying political science at the University of Texas at El Paso, she sees the Explorer Program as a first step in a long career. Sarah Blesener is a documentary photographer based in New York City. Born in Minneapolis, Minnesota, she studied Linguistics and Youth Development at North Central University. While in University, she worked as a photographer for the organization Healing Haiti based in Port au Prince, Haiti, covering events surrounding the 2010 earthquake. Upon graduation in 2012, she studied at Bookvar Russian Academy in Minneapolis, concentrating on the Russian language. She is a recent graduate of the Visual Journalism and Documentary Practice program at the International Center of Photography in New York. Her latest work revolves around youth movements and culture in Russia, Eastern Europe, and the United States. She is a recent recipient of the Alexia Foundation grant for her 2017 work in the United States, and a current fellow with CatchLight, working with CIR / Reveal.